Mass slaughter in Oslo. Oslo home of the Nobel Peace Award investiture. A right wing nut job has perpetrated a mass killing - the helicopter pictures of the island and all the tents were reminiscent of those from Jonestown Guyana. The Norwegians are in total shock. The Port Aurther massacre in Tasmania sounds a bit like what happened too - although there was no political agenda with that - so how much was this massacre a death wish rather than a 'political' action? Was the attack on the island of camping left wing kids more to do with potential body count success in his killing fantasy than any other consideration? When you look at all these examples of spree killings you find that at no stage will the killer stop once they have started - that's the chilling aspect, they will keep on killing. I can't remember examples of anyone not going through with a planned mass killing once it has started. 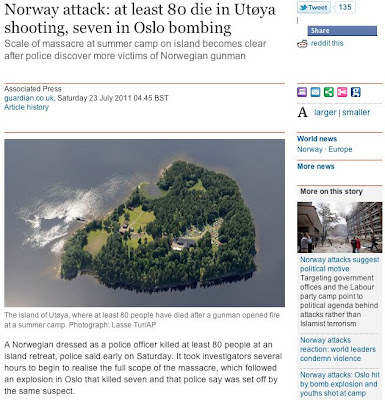 NZ and other nations have said they support Norway against terrorism, but given this looks like a lone killer with a purely domestic agenda and these terror acts directed at domestic political targets that's not really helpful for Norway or any other nation with lone psycho domestic terrorists. If he was part of a group however that changes things, but it is too early to answer these questions. 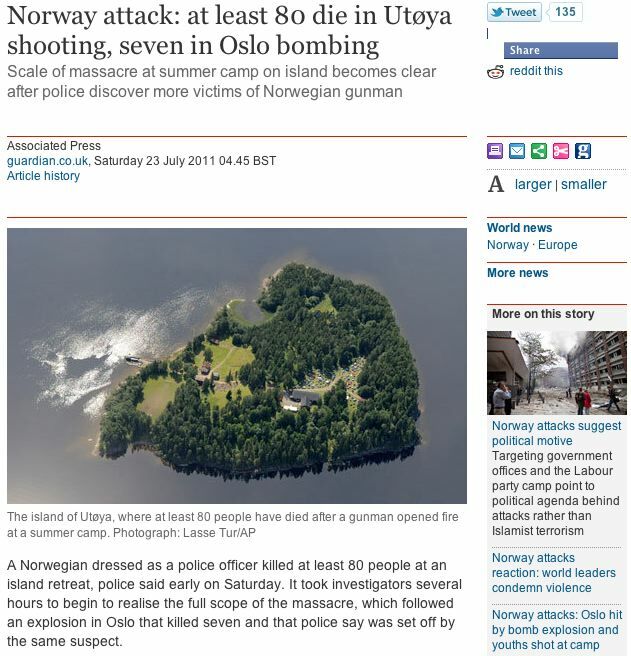 Too early too to predict the Norwegian response regards the firearm he had (and whether they will be banned in the same was the Aussie federal government cracked down on semi-automatics after Port Aurther) or how he managed to detonate a bomb right outside the main government building. The Nowegians must be shaken to the core from this - its magnitude, its malevolence. I wonder why these crazed gunmen never cut loose at one of the many "gun fairs" dotted around the US? Probably because, at their very core, these deranged killers are gutless cowards and understand that at a gun fair there are 1,000+ other gun-nuts who will shoot back.